What comes to mind when you hear the word “recipe”? Likely a long list of ingredients and a whole lot of time. But not all recipes are time consuming. On-the-go keto breakfast recipes are simple and quick to whip up! You can meal prep them before the week begins and take them with you on your busiest days. There’s no excuse to stop at a drive-through or pick up a muffin at the nearest Starbucks. In this post we’re sharing 8 low carb on the go options you’re sure to love! If you’re new to the keto diet, it’s a very low carb diet that helps your body burn fat. When you’re on the keto diet, your body produces ketones in the liver to be used as energy. When glucose is in short supply, fat is used as alternative fuel for the body. On the keto diet, your body switches its fuel supply to run almost entirely on fat, and it makes it easier to access your fat stores to burn them off. This makes it easier to lose weight, makes you feel full faster, and helps elevate your energy level over a longer period of time. The main goal of keto diet meals is to take away carbohydrates and fill your body with healthy fats. When you do this, your body starts to burn ketones as its main energy source. A proper ketogenic diet menu will help you lose weight and maintain a healthy lifestyle. Breakfast is key to helping you lose weight. When you eat breakfast, you activate the thermogenesis process, stimulating your metabolism. If you start your day with a boosted metabolism, it will set you up for better weight loss success throughout the day. Without a proper breakfast in the morning, you’re more likely to reach for high calorie foods throughout the day. Skipping breakfast can lead to a higher weight and an increase in fat mass, so it’s important you get in your first meal of the day. Just make sure it’s healthy and keto approved! Eating a high sugar cereal or pastry will do more harm than good. When you have rushed mornings, meal prep is key! Here are 6 tips for easy weight loss! Meal prep is easy when you know exactly what’s on the menu for the week. When you’re creating your weekly meal plan, choose meals that have the same ingredients so you don’t have to pick up too many things at the grocery store. Ingredient overlap is key! Make a list and stick to it! Many people like to meal prep on Sundays, but pick a time and day that works best for you. Unless you schedule in the time to shop, prep and cook, it probably won’t happen. You’ll need about 2 to 3 hours, so figure out when you can best fit it into your schedule. Meal prep is so much easier when you have the proper containers to store your food in. They’ll help you keep your ingredients and meals organized so you can put your meals together in a snap! If you’re following the keto diet, you likely have lots of meals that contain vegetables. Wash and chop all your veggies up on meal prep day to save you work during the week. This goes for veggies that are going to be kept raw, or used to cook in a dish. Either way, you’ll get huge time savings. Prepping protein such as sausage, eggs, and beans is a great way to save time during your busy weekdays. You can make them on meal prep days and keep them stored in the fridge to throw into your meals when you need them. Foods like muffins and puffs are easy to make and small enough to store in your freezer. Rather than thawing a whole dish, you can take them out when you’re ready to go and save lots of time! If you’re looking for keto breakfast to go for your busy mornings, you’re going to love the recipes below. And if you’re looking for more filling breakfast ideas, this collection of 30 keto breakfast recipes by Tasteaholics is a great (and inexpensive) buy. With up to 5 net carbs per meal, each recipe consists of only 5 ingredients and 5 easy steps, making them the perfect option for busy people like you and me! Breakfast muffins are the perfect food to grab on-the-go. Made with eggs, cheese, ham, and lots of veggies, you get all the keto benefits on your busiest mornings. Fat bombs are one of the best ways to get healthy fats into your body on the keto diet, and these peanut butter ones are packed with protein to keep you full throughout the morning. They’re incredibly easy to take on the go! These sausage ball puffs are sure to keep you satisfied until lunch, with ingredients like breakfast sausage, sour cream and cheddar cheese. They’re easy to make and even easier to pop in a bag and take them with you for breakfast on the go! Granola is the perfect breakfast to pack up and take on the go because you can reach in and eat it whenever you like. It’s crunchy, flavourful and packed with good-for-you keto ingredients! These savoury breakfast cookies are one of the best options for a low carb breakfast to go. With onions, peppers, sausage, eggs, and cheese, it’s the perfect breakfast to keep you satisfied all morning. Not only are these breakfast muffins delicious, they’re also packed with fiber to help you feel full throughout the morning. Whip them up on Sunday to have a quick breakfast ready throughout the week. Take these breakfast protein bars with you on your busiest days. They taste delicious and will keep you fueled so you don’t lose your energy before you re-fuel at lunch. Recipes aren’t always intricate and time consuming. These on-the-go recipes ensure you’re fuelled and take barely any time to make! 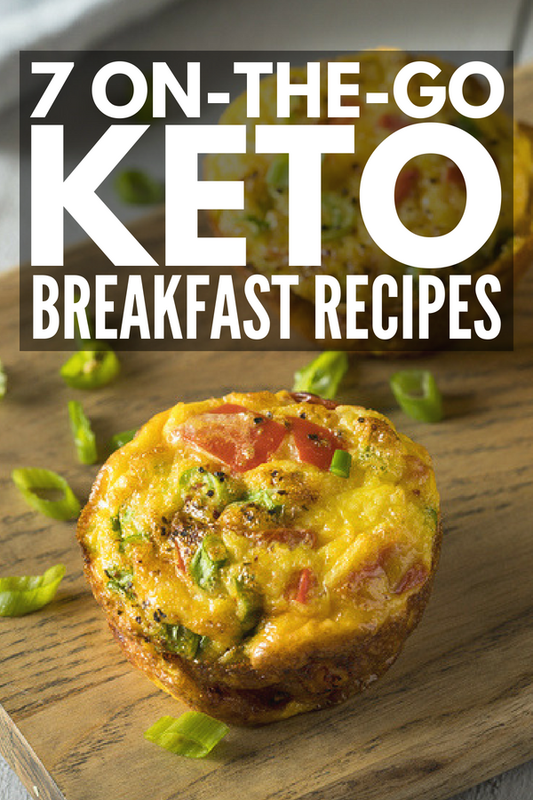 If you love these on-the-go keto breakfast recipes, make sure to pin the image below on Pinterest! And if you want more keto recipes, check out our Health Board on Pinterest!